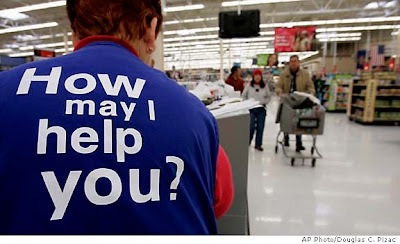 Wal-Mart stores can be so big and the workers seem so bored and the customers seem so harried and annoying. It seems like the perfect fertile ground to have a little fun at Walt's expense. Sometimes I just want to jump on the intercom and say something. But how does one get access? You're now on the store intercom! The proper way to use the store intercom, I mean, apart from the fact it is only supposed to be used by Wal-Mart employees, is to declare the code and the location. For instance, "Code White in Automotive". Here are a few helpful things you can do with the Intercom. INTERCOM HOLD: Sometimes silence is golden. So if you pick up the phone, dial #96 and then hit hold, nobody can use the intercom until they figure out which phone is on hold. CODE 1: This code is used for SHOPLIFTING! CODE 90: Management Needed. That sounds useless. CODE 99: This code implies that there is an emergency and all male employees are to immediately stop what they are doing and move to the announced location. CODE 300: Security Needed. For grins, call Code 300 to the location you are currently at. CODE ADAM: Code Adam is used to report a lost child. Technically, the store is supposed to shut all doors until the lost child is found. This sounds like fun until you realize that you are going to be trapped in a Wal-Mart for hours while they attempt to locate a missing child. CODE BLACK: This code is used for severe weather. It's only used if something severe is happening such as tornadoes are bearing down on the store. All employees are supposed to immediately head to the fitting rooms at the center of the store. Wal-Mart doesn't like to use this code because it quite frankly, when the employees all leave, it leads to looting. CODE BLUE A bomb scare. CODE C: Customer service. A customer needs help in a location like housewares. CODE GREEN: This code is used when there is a hostage in the store. Ask yourself, do you really want to shop at a store that needs to have a special code for a hostage situation? CODE ORANGE: This is for a chemical spill. Water is a chemical. CODE RED: This is used in case of a fire! CODE WHITE: is used for an injury. With knowledge comes power and responsibility. Use it wisely.